Deductions are the Internal Revenue Service’s gift to taxpayers. They subtract from your taxable income, so you pay taxes on less. You can itemize your deductions, tallying up everything you spent on qualifying expenses during the tax year and subtracting the total. Or you can claim the standard deduction for your filing status, which is often more advantageous than itemizing because standard deductions more or less doubled under the terms of the Tax Cuts and Jobs Act (TCJA) in 2018. You can’t both itemize and claim the standard deduction as well. That’s against the rules. But you do have a third option: You might qualify for one or more above-the-line deductions, too. These are the real gifts under the U.S. tax code because you can claim these deductions and claim the standard deduction or itemize, too. Technically, these deductions are called “adjustments to income.” They're also referred to as “above-the-line” because they’ve historically been taken on the first page of the Form 1040 tax return, before the line that designates your resulting adjusted gross income (AGI) after they’ve been subtracted. Then you can subtract your standard deduction or the total of your itemized deductions from this number to arrive at your taxable income. The Internal Revenue Service has introduced a brand new Form 1040 that you must use when you file your 2018 tax return in 2019. The new form has been reduced to fewer lines…but now there are numerous schedules that many taxpayers will find they must file with their returns. These schedules cover all the information that used to be entered on the old 1040’s now-missing lines. Your AGI is a magic number because it determines whether you qualify for several other tax deductions. You’ll find yourself out of luck if your AGI is too high—you’re either prohibited from claiming these other deductions, or you can’t claim as much as other folks who have lower AGIs. Take the itemized deduction for medical expenses, for example. As of 2019, you can claim a deduction for qualifying costs that exceed 10 percent of your AGI. If your AGI is $80,000, you can only deduct medical expenses you paid in excess of $8,000. But if your AGI is $35,000, that threshold drops to $3,500. And that’s just the tip of the iceberg. Affordable Care Act subsidies for health insurance depend on your AGI, as does qualifying for the Child Tax Credit, the American Opportunity tax credit, the Lifetime Learning tax credit, the Child and Dependent Care tax credit, and the Earned Income tax credit. The amount you can contribute annually to various tax-deferred retirement plans also depends on your AGI. Obviously, the lower it is, the better off you are. And there are several above-the-line deductions that you might qualify for to bring your AGI down. Three above-the-line deductions can help out if you’re self-employed. First, you can claim one for half the self-employment tax you must pay because you work for yourself rather than an employer. If you contribute to a self-employed retirement plan, those contributions are an above-the-line adjustment to income as well. Finally, you can claim the premiums you pay for health insurance and long-term care policies for you and your dependents without itemizing and being subject to that 10-percent rule, up to the amount of your business’s net income. A word of warning, however: If you’re married, your spouse works, and he’s eligible for health insurance coverage through his employer that would cover you as well, you can’t claim that last above-the-line deduction. The same goes if you also hold down a regular job and you’re eligible for insurance coverage through your employer. This adjustment to income technically expired under the TCJA, at least for those who become divorced in 2019 or later. But if your divorce was final before Dec. 31, 2018, and if you’ve been ordered to or agreed to pay alimony, the total you pay per tax year is an above-the-line adjustment to income. Depending on how much you give your ex, this can be a really hefty deduction. Before the TCJA, Congress took the position that your ex is benefiting from this money, and as such, she should be the one to pay taxes on it. You can, therefore, subtract the amount you pay to arrive at your AGI. Your ex will have to claim and pay the tax on this income instead, so you must provide her Social Security number on your tax return to the IRS can make sure she does. Child support you might pay isn't tax deductible, so your divorce decree or alimony order should clearly indicate that the payments you’re making are indeed alimony or spousal support. Maybe you were feeling flush last year so you invested in a certificate of deposit (CD), then something happened to make you feel not-so-solvent after all. You cashed in the CD before it matured, only to be hit with a penalty for doing so. There’s an above-the-line deduction for these types of fees as well. You should receive a 1099-INT, 1099-DIV, or a 1099-OID form from the financial institution, telling you the total penalty that you can claim on your tax return. It might not be much, but every dime helps. The money you contribute to an IRA is also deductible above-the-line, or at least some of it is. There are limits to how much you can invest, based on—you guessed it—your AGI before you claim these amounts as adjustments to income. Some other rules also apply, too, such as whether you or your spouse have access to employer-provided retirement plans. Contributions to 401(k), 403(b), and 457 plans are eligible for this deduction as well, again subject to phaseout rules that are dependent on your AGI, but Roth accounts don’t qualify. You can invest money into a health savings account to pay for certain healthcare costs that aren’t covered by your health insurance plan, and these contributions are also above-the-line adjustments to income. The catch? The plan must be a high-deductible policy, and group policy coverage doesn’t qualify. Your contributions must be made with “after-tax” dollars—in other words, they weren’t deducted from your pay before taxes were withheld on the balance. That would effectively give you two tax breaks on the same money. If you’re pursuing a college education or you’re paying for a dependent or your spouse to do so, you can claim an above-the-line deduction for up to $2,500 in interest you pay per year on qualifying student loans. AGI limits prior to claiming this deduction apply here, too, however. You can’t claim the student loan interest deduction if you’re a single taxpayer with an AGI of $85,000, and you won’t be able to claim the entire $2,500 if your pre-student loan interest deduction AGI is $70,000 or more. These limits increase to $170,000 and $140,000 respectively for married taxpayers who file joint returns. You can’t claim this one at all if you’re married by file a separate return. Teachers and some other school employees can claim an above-the-line deduction for up to $250 as a sort of reimbursement for money they spend out of pocket on classroom supplies. Costs associated with taking certain courses are deductible as well. Some rules apply, however. You must have worked at least 900 hours during the tax year, and being employed by a post-secondary school doesn’t count. 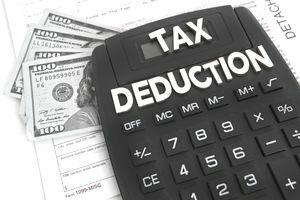 Some well-known above-the-line deductions disappeared in 2018. You might have heard that you could claim job-related moving expenses as an adjustment to income, but not anymore. The TCJA eliminates this tax perk for anyone other than members of the Armed Forces, and even then, certain conditions must be met. It might come back when the TCJA expires at the end of 2025, however. You used to be able to deduct tuition and other educational fees you paid for yourself, your spouse, or your dependents, but this tax provision expired on Dec. 31, 2017. There’s still hope that it might be resuscitated for the 2018 tax year, however, so stand by.